Since 1973, O'Hara Landscape and Maintenance Inc. has been providing reliable landscape maintenance for residential property. Lake Park Florida Residential Landscaping adds to beautification of thousands of residential properties and private homeowners in Lake Park Florida. Lake Park Florida Residential Landscaping. For O'Hara Landscape Design and Maintenance Inc. in Lake Park, Landscape maintenance is an important aspect of keeping your home looking beautiful. O'Hara Landscape Design and Maintenance Inc. is available for both residential landscaping and commercial landscaping. Residential homes in South Florida need constant lawn mowing and trimming of plants and hedges. Whether you have a small garden or a large landscape design on your property, keeping your lawn trimmed and maintained at the proper time will keep your property looking clean and neat. Proper lawn maintenance and trimming on your property is done with our sharp blades. Your lawn will look beautiful. Home landscaping is also part of what O'Hara Landscape Design and Maintenance Inc. in Lake Park can do to give your home a fresh new look on the outside. Landscape Maintenance of your lawn includes trimming your lawn, trimming your hedges, mowing your lawn and removing all grass clippings and litter from the lawns during every mowing operation. Lake Park Florida Residential Landscaping services from O'Hara Landscape Design and Maintenance Inc. We also add new mulch to your gardens to keep your plants happy and your gardens growing. As a homeowner you can select the lawn maintenance frequency for both trimming your hedges and mowing your lawn. The flexible schedule we offer will be beneficial for you and your lawn. When cutting your lawn, we make sure the mowing height is correct for any turf variety. O'Hara Landscape Design and Maintenance Inc. in Lake Park keep equipment in top working condition. O'Hara Landscape Design and Maintenance Inc. makes sure our mower blades are sharp and level to minimize scalping. This will give a beautiful cut to any lawn. Lawn Maintenance includes the trimming of high grass. Grass is line trimmed with weed eaters where a lawn mower cannot reach. To complete your lawn maintenance and insure your lawn looks its best O'Hara Lawn and Maintenance uses mowers, weed trimming and landscaping. Lake Park Florida Residential Landscape and Design. All vehicles are radio dispatched and supervision carries cellular phones to offer prompt electronic access for directors and managers. Work orders and requests are received electronically and are responded to as priority items. Service interruptions are minimized by regularly upgrading equipment and reviewing safety procedures. O'Hara Landscape Design and Maintenance Inc. is fully licensed and insured. Lake Park Florida Residential Landscaping. O'Hara Landscape and Maintenance Inc. understands our clients landscape is an asset to enjoy, not a burden to fret over. We pay attention to all the paved areas and curbs which are edged, blown off, and vacuumed during every mowing operation. Excess clippings are removed from the lawns. 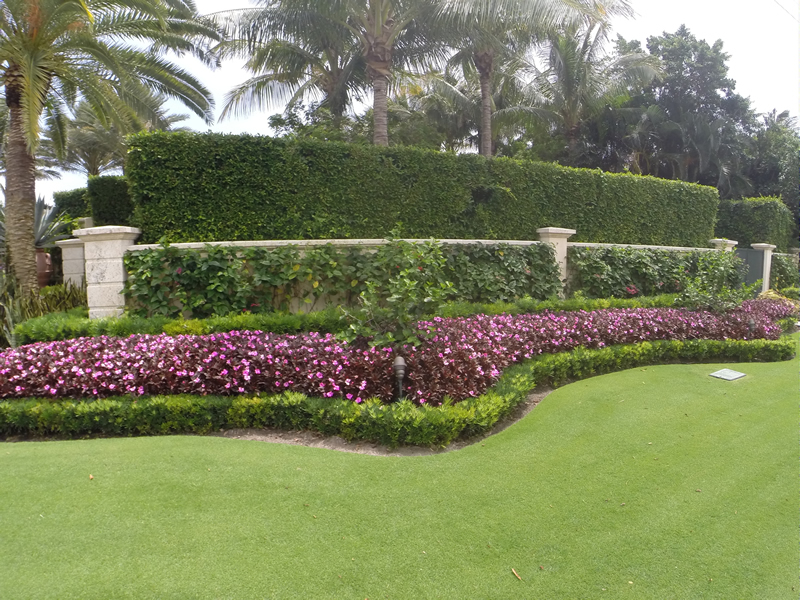 We offer landscape maintenance services for residential property for private homeowners in Lake Park Florida. O'Hara Lawn and Maintenance pays attention to all the paved areas. With weed trimmers O'Hara Lawn and Maintenance makes sure curbs are edged, blown off, and vacuumed during every lawn mowing. Excess clippings are removed after mowing lawns. O'Hara Lawn and Maintenance service residential property for private homeowners in Lake Park Florida. O'Hara Landscape maintenance complete Lawn care services for residential property in Lake Park Florida. O'Hara lawn maintenance services include lawn mowing and trimming. Lawn maintenance services also include garden and flower bed maintenance for residential property in Lake Park Florida. Residential property services include landscape maintenance proper shape, healthy growth, and optimum bloom. Clean up of trimming debris is completed daily. Tree limbs and sucker shoots are bottom pruned for improved aesthetics, access, and visibility. Tree limbs are pruned away from buildings. Dead and yellowing fronds are removed from the palm trees. O'Hara Landscape and Maintenance Inc. offers services for tree trimming and bushes pruning in Lake Park Florida. Plant beds and Flower beds are carefully edged by specialists to maintain proper size and good form. We use blades and do not use herbicides to form flower bed edges. We use a combination of manual and chemical to effectively control plant bed and pavement weeds for residential properties in Lake Park Florida . For residential property, we apply premium grade, slow release fertilizers specifically formulated for your lawns, plants, trees, and palms. Lawn fertilizers are applied in a manner that promotes a consistent, green turf. Residential property fertilizing programs in Lake Park.